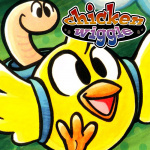 Chicken Wiggle is a rather promising title from Atooi that's making its way to the 3DS eShop - from the same team that produced Mutant Mudds as part of Renegade Kid, it adopts that title's style while also introducing new ideas. The Chicken and Worm combo throws in some alternative controls and moves, while it also boasts a full level editor and online sharing that could add endless content beyond the core campaign. Jools Watsham has now posted another video showcasing the level editor, looking at a different set of tools from those shown previously. It seems to be shaping up rather well. Are you keeping a watchful eye on tis 3DS eShop title? I'd love to see more footage without the commentary, but I've pretty much made up my mind. If this gets released at all (and with that Renegade Kid lineage there's no guarantee it will), I'm buying it. Jools, you old geek. I love this character, it's Toki Tori and Banjo Kazooie mashed up and adorable, with a dash of New Zealand Story and a boatload of heart and pixel goodness.